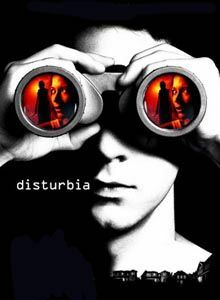 The 2007 movie "Disturbia" isn't exactly a remake of the classic Hitchcock thriller, "Rear Window", but it comes close. 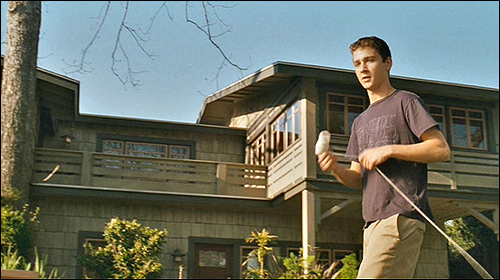 The plot has young Kale (Shia LaBeouf) confined to his room by house arrest (and an electronic ankle bracelet), who fights boredom by spying on his neighbors, who include: the man across the street who is cheating on his wife with the maid, some bratty kids whose Mom is unaware that they are watching adult cable TV behind her back, the hot new girl who just moved in next door (Sarah Roemer), and Mr. Turner (David Morse), the seemingly normal neighbor who may be hiding a deadly secret. 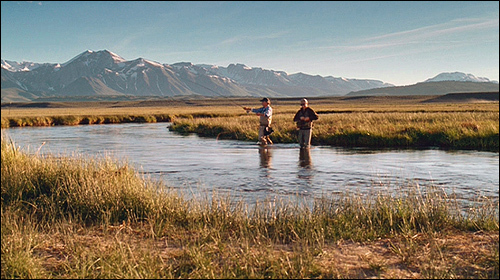 Those fishing scenes were filmed in the winding Owens River, up at Benton Crossing, about 16 miles east/northeast of the town of Mammoth Lakes, and a good 250 miles north of Los Angeles. 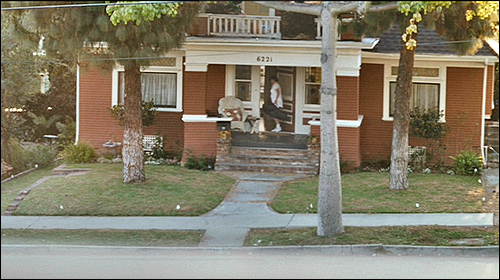 The main "Disturbia" house, Kale's home, is located at 6222 Painter Avenue, in Whittier, CA. Kale's home is on the east side of Painter Ave, three houses south of Broadway. In the photo above, we are looking at the west side of the house (with the camera pointed (northeast). The lawn where he is busted by the cops (after accidentally straying outside his limits) is on this same west side. The driveway, where he talks to Ashley (across the rope), is on the south side of the home. The town of Whittier is located about 20 miles southeast of downtown Los Angeles. 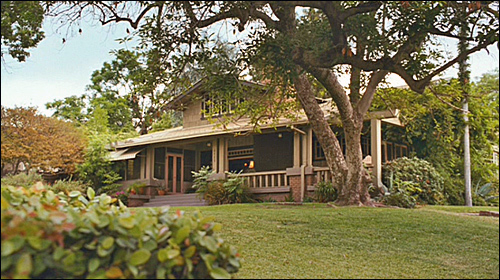 The section of Painter Avenue seen in the movie is located just four blocks north of Whittier College, the alma mater of former President Richard Nixon. It's also about a mile east of Whittier High School, where they filmed the school scenes for "Back To The Future". Ashley's house is (as you would expect) right next door to Kale's house (to the south). The address is 6232 Painter Ave., in Whittier. The window (through which Kale watches her undress) is located on the north side of the house (so Kale was looking south), on the second floor. The shingled roof where she sunbathes is located right outside (north of) that window. But it's not quite as simple as it looks. 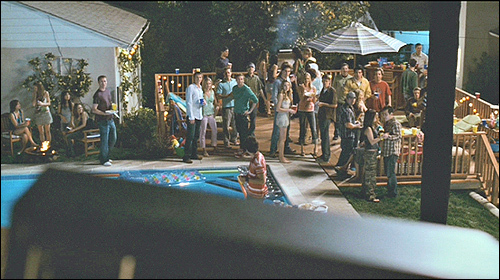 The pool in the back (where Ashley swims) and the wood deck (where she throws a party) are both fake. They're not really at the house - they were built on the spot by the producers. That pool area (to the east, between the house and the rear garage) is really just open space. Remember the Pilchs' house? The red one where Mr. Pilch is carrying on an illicit affair upstairs with the maid when Mrs. Pilch goes out to play tennis? Well, it's right where you would expect it to be, on the other side of Painter Avenue, directly across the street from Kyle's house. The address is 6221 Painter Ave., in Whittier. 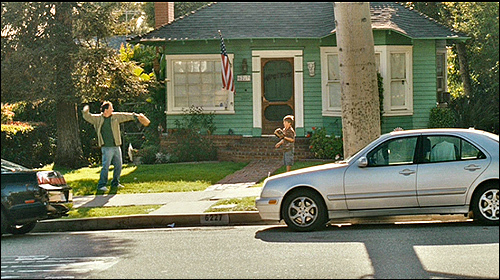 Immediately to the left (south) of the Pilch house is the small green house where Kale watched a father toss a baseball to his son, out on the front lawn. The address is 6227 Painter Ave., in Whittier. 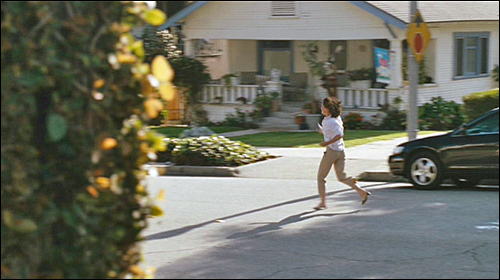 And directly to the left (south) of the green house is the small white house which Frankie's mother runs past (early on in the movie), chasing the little kid driving his Big Wheel tricycle down the street. The house is right across the street from Ashley's house.